With its clean lines and simple design, the Cap Chrome Stool Cream is a versatile model that enhances the beauty of its surroundings. 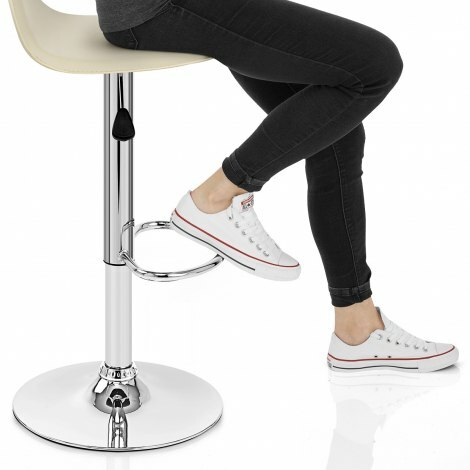 Complementing a range of spaces with its compact yet comfy appeal, the Cap Chrome Stool is the perfect choice for many. Upholstered in contemporary cream faux leather, the seat and backrest are ergonomically shaped to support you in your most comfortable position. Beneath the seat is a mirrored chrome frame, which incorporates both a gas lift mechanism for adjustable height and 360-degree rotating movement. A stylish half-moon footrest is incorporated for an even more supportive sitting experience. To help avoid damage to your floor, the base of the Cap includes a rubber floor protector. "Nice and compact comfortable and neat"
I have a very shallow breakfast bar so I required a bar stool that was not too deep or high. These are ideal. I also appreciated the free next day delivery service. Superb service. Am very impressed with your company. Sturdy, great size for a shorter breakfast bar & very comfortable. A neat, but sturdy nice looking kitchen bar stool. Fits nicely under the breakfast bar. A smaller diameter base than most stools. Very good value for money. We purchased 3. Easy to assemble. Next day delivery. These are great stools and admired by many. Very pleased with the swift and efficient delivery.